Cascaders and their families joined together for a tree-planting project - 50 trees were planted at the Norampac-Viau plant. By 2022, Montréal plans to add 300,000 new trees through Plan d’action canopée, an initiative being developed by the Ville de Montréal and the Société de verdissement du Montréal métropolitain, Soverdi. So, where do you find room for that many trees? One answer among many is to start with existing industrial and commercial land. 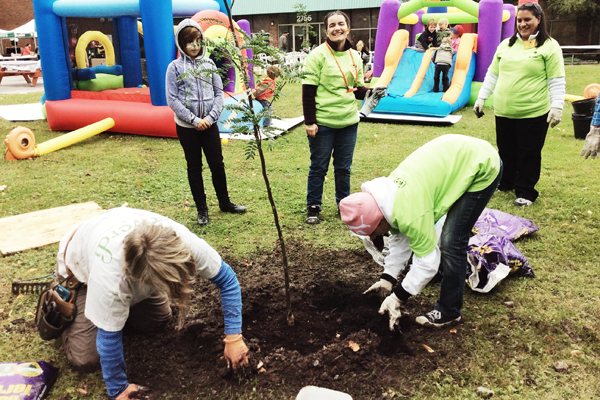 In response to the Révélez votre nature campaign, we organized a planting of 50 deciduous trees on the site of our Norampac-Viau division, just a few steps from the Olympic stadium. The number of trees is a nod to Cascades’s 50th anniversary this year! The planting, which took place on September 14, was the centrepiece of a family event in celebration of Cascades’s 50th year in business. Norampac-Viau employees and their families came out in droves, with an attendance of over 400. 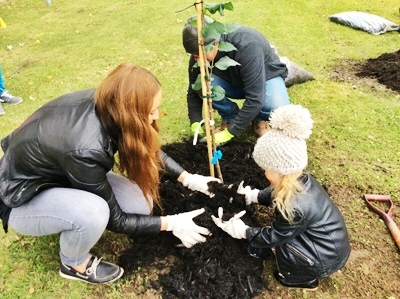 The weather was perfect for the dozens of families to put on their gloves and dig in their shovels to plant “their” tree. 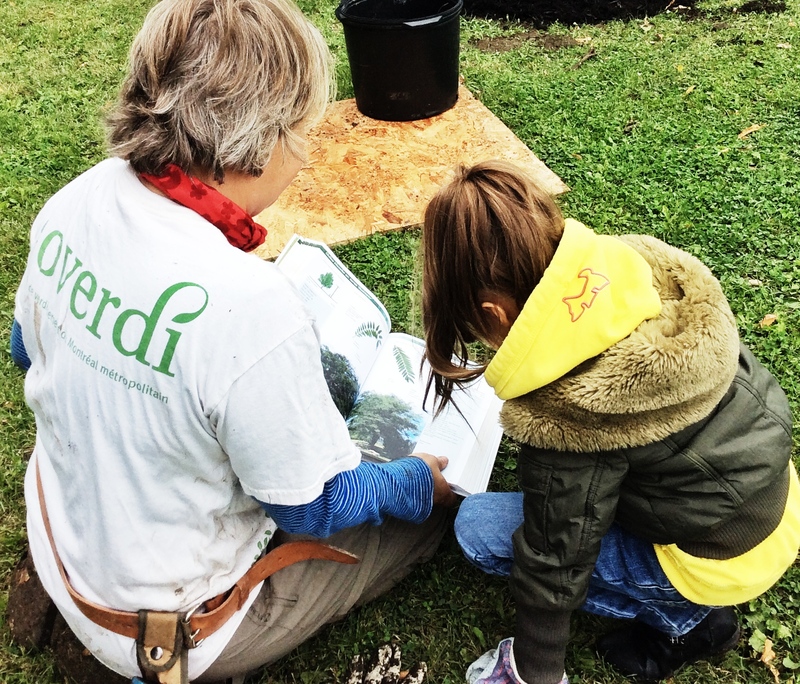 In a flurry of fertilizer, soil and mulch, the Soverdi team helped guide the participants through the different planting steps to ensure that the trees will thrive for many years to come. These tree specialists were also available to share tips and fun facts with curious participants, including descriptions of the different types of deciduous species being planted: 8 red maple, 5 bitternut hickory, 5 western catalpa, 5 hackberry, 8 Skyline honey locust, 5 Amur corktree, 5 European mountain ash and 9 Japanese tree lilac. The Révélez votre nature campaign invites organizations on the island of Montréal to join the movement for all kinds of environmental and social reasons: to reduce heat islands, to increase biodiversity and to enhance the living space enjoyed by employees and nearby residents. In the words of Soverdi, planting trees cools cities, purifies the air by capturing dust and pollutants from various urban activities, and helps return water to the soil by increasing the amount of permeable surface. We know that trees enhance our outdoor environment, but in a broader sense they also represent a resource for Cascades to use with respect and care. In 2013, 3 million short tons of recycled fibres were used to make Cascades products. This accounted for 79% of our consumption of fibre and pulp, and allowed us to save nearly 44 million trees from being felled. If you happen to be at the corner of Viau and Pierre-De Coubertin in Montréal, you’ll see the new trees planted by our employees and their families. You can even identify each tree and the people who planted it using the Branché app! If you have room for new trees anywhere in the city, we encourage you to join the movement! See the tree planting photo album here.